The football season has already started and the excitement begins. It is in my opinion one of the best times of year where delicious meals are shared. On this occasion I offered for the first game, bring dessert since I almost always have to do a main course, but not this time, and I offered to make some delicious and succulent cupcakes with Nutella. Delight in my mouth just thinking about it I would like to be eating another, the only disadvantage of bringing dessert is that everyone looks forward to finish the meal and the dessert is over too fast. These exquisite cupcakes are quick and easy to make considering that we should not spend a lot of hours in the kitchen because you have to enjoy the party. So enjoy a great time with your favorite teams, family and friends and remember that no matter who wins or loses, the most important is family fun. Preheat the oven to 325 ° F.
Line 24 medium-size cupcake cups with paper liner, you’ll need two cupcake pans with 12 cups each. In a bowl mix cake mix, water, oil, egg whites and vanilla, stir well until well incorporated, place a cup of the mixture in a separate bowl and toss with the ½ cup of Nutella. Fill each cupcake cup liner about two thirds full with the cake batter and add 1 tablespoon of the Nutella batter in the center of each cupcake cup. Bake for 28 minutes. When ready, let cool in pan for 5 minutes and then move to a wire rack to cool completely. And if you need more inspiration for this football season, here are more delicious recipes from the #SundaySupper family, enjoy. Please be sure you join us on Twitter throughout the day during #SundaySupper. We’ll be meeting up at 4:00 p.m. PT for our weekly #SundaySupper live chat where we’ll talk about our favorite cookout recipes! 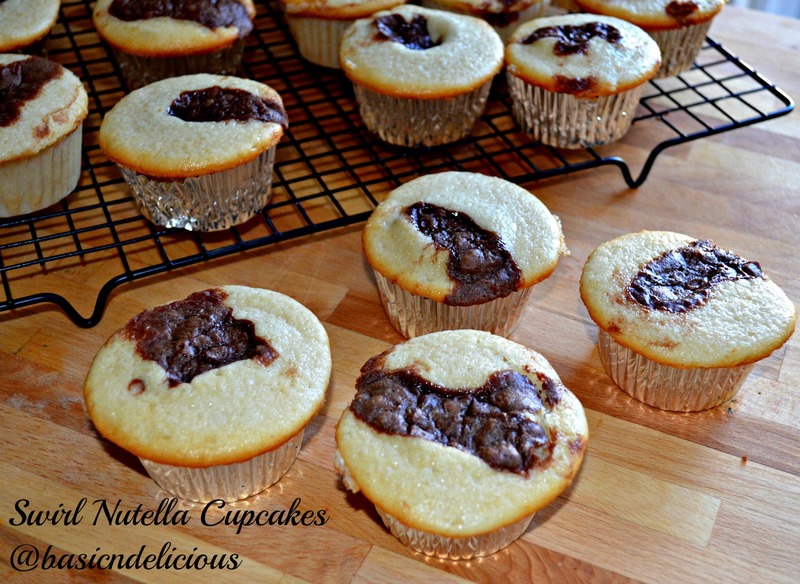 This entry was posted in #SundaySupper and tagged baked, cupcakes, nutella by Kathia Rodriguez. Bookmark the permalink.